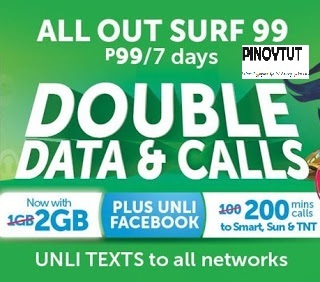 We got this, Smart Communications has upgraded their consumable internet promos. They're now offering Consumable net for 7 days with free Facebook and unlimited all network texts. Select your promo beneath and revel in a week-lengthy net get admission to and other advantages. Those promos are higher availed in case you want to get entry to the internet the usage of your mobile telephones. This isn't advocated to be used in computer or laptop internet usage. Dailymotion/Dubsmash, unlimited all net texts and FREE Facebook access. To register: Send GIGA70 (or BIG70) to 9999 and wait for the confirmation message. Once done, enjoy your 1GB internet access with FREE FB and unli allnet texts for a week! To register: Send ALLOUT99 to 9999 and wait for the confirmation message. Enjoy! The GIGA70 is a better version of Globe's GOTSCOMBODD70. Recently, Globe had stopped providing FREE Facebook to all their promos. So, make the switch or have a dual network. The consumable internet provision can view all websites and can access all internet games, you only need to monitor your usage so as budget your internet consumption. To check your remaining consumable balance, do a balance inquiry via your Smart Menu.